A hardwired neo-cortex &mdash; What role for neuroplasticity and developmental processes? A hardwired neo-cortex — What role for neuroplasticity and developmental processes? Is the neo-cortex of the brain hardwired or not? This is the central question George Ellis and Mark Solms of the University of Cape Town set out to answer in the seven chapters and 177 pages of this book. Regardless of which side of the argument one is on, there is a guarantee of a fulfilling read, with the latest information about the modern brain and its evolution. The main point of this book is that there is no language or any other instinctual system in the neo-cortex. Evolutionary psychologists claim that the mind is a product of evolution and natural selection.1,2 We have adapted successfully to our environments because the mind (specifically the neo-cortex) is modular and hardwired for specific functions, which provides us with innate knowledge from birth and equips us for survival in an environment with a 'poverty of stimulus'. An example is that of Chomsky's innate module for grammar which Pinker3 later argued was a 'language instinct' (see Rose4). We required such a mind in the context of an 'environment of evolutionary adaptedness' to the African savannah but would it help us survive modern life? The gene took central position from about the mid-20th century - the period of the new synthesis of Darwin's theory (in 1859) with modern genetics - with a convergence of ideas of heredity from several sources5-8: the ('selfish') gene was the unit for natural selection8, the meme its cultural counterpart and gene-culture coevolution the new idea9. Textbooks traditionally focus on the physiology and anatomy of the brain, underlined by the principle of structure related to function. But the brain also produces our subjective mental life and yet the neurosciences, until quite recently, avoided studying feelings and emotions on the grounds that an objective science could not study the subjective experience, despite the implications of the injury and associated changes to the personality of Phineas Gage in 1848.10,11 Francis Crick's 'astonishing' hypothesis and scientific study of the 'soul'12, was possibly a step forward in 1994? 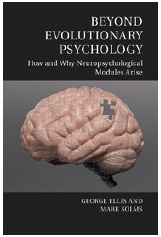 This book by Ellis and Solms represents both a recent paradigm shift from gene-centred thinking and a refutation of the claim of neo-cortical innate modularity, providing an integrated view which suggests that the structure of the neo-cortex is a 'soft-wired' arrangement of inter-connected neurons, genetically designed but sculpted by developmental processes that involve interaction between the brain and environmental stimuli under the guiding influence of the limbic system (affect): 'These specific connections develop through our life experiences and social interactions, which continually alter synaptic strengths by modifying gene expression' (p. 106). Whilst genes play a role in brain development, the brain's plasticity in response to the environment is crucial, and allows humans with roots in the African savannah to happily adapt to urban life today. This is the 'evo-devo' tradition which unites evolutionary theory with genetics and with developmental studies with less emphasis on the gene13, and more of an understanding that evolution, development, structure, function and environment are all crucial to our survival and have to be understood in a contextual way. The unit for natural selection is far more than just the gene! Innateness in the brain is in the limbic system which is the seat of human emotions, and is shared with other mammals.14 Our primary emotions are hardwired in all mammals and selected for by natural selection, thus playing a key role in evolutionary development.15 The developing cortex, in its exposure to environmental stimuli, responds by allowing competing neurons to form brain circuits by a process of adaptive selection and neural Darwinism16, under the guidance of emotions through ascending neural pathways and neuromodulators, which in turn influence cognitive activity and brain plasticity. Emotions produce a specific reaction to an inducing situation, tempered in humans by higher reason and wisdom, and they regulate the internal state of the body, ensuring that, for example, heart rates change during flight in fear.15 It is the influence of this emotional system that underlies the intellect and shapes other aspects of human behaviour, giving meaning to what it means to be human. Emotion therefore has been selected for, has played a key role in evolutionary development and, in turn, has affected evolution. Innate modules in the neo-cortex would be restrictive in responding to an unpredictable environment, and do not account for the plasticity of the brain or its compensatory mechanisms during injury. Also, the 'poverty of stimulus' argument disregards the richness of stimuli during the mother-neonate bonding period. To understand the function of the mind, the reader is asked to consider the hierarchical nature of its multi-level structure, which gives rise to complexity and many levels of emergence, thus allowing for a top-down causality in response to stimuli, and bottom-up causality where lower-level structures are adapted to higher-level functions. The brain straddles two worlds - the inner and the outer - and the book beautifully explains the transition of activity from the physical to the mental; for example, when blood sugar levels fall, we feel hungry and act upon that feeling. Information from the sense organs is relayed to the appropriate cortical regions via the thalamus, forming our perceptions (percepts), which become concepts, the raw material of cognition, the further these move from the posterior to the anterior cortex. To survive and reproduce, the organism seeks its internal needs in the outside world. This is the biological purpose of cognition, which is guided by our hardwired emotions, without which there would be no survival. The fittest, whether individuals or communities, in the strongest social contexts, shall be the unit of natural selection. Resolving the nature-nurture debate would have important implications for learning, reading and writing. A young brain is shaped by story-telling17 and this book can make a positive impact on our failing educational system and illiteracy. There is a difference between folk knowledge and higher academic learning which requires effort and motivation on an individual's part in dealing with counter-intuitive ideas. Also, importantly, there is an epistemology of the brain sciences and evolution, in general, in this book that the reader can appreciate.